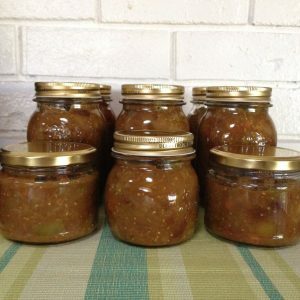 My green tomato relish recipe is mix of favourite ingredients. 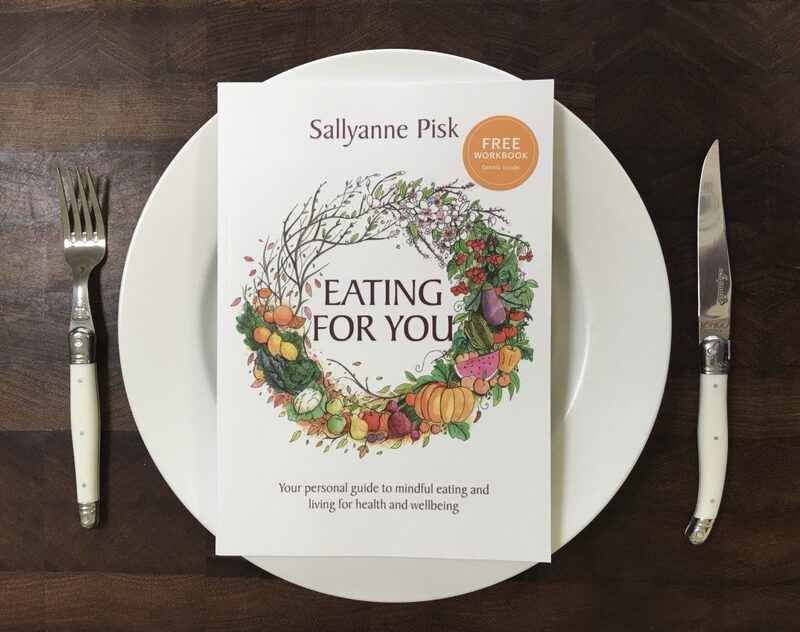 My aim with this recipe was to minimise the addition of sugar and salt. Through my research I uncovered the main difference between relish and chutney. Prior to my gardening and preserving experience I had never considered this! Relish promotes the tart and sour tastes, whilst chutney through the addition of sugar is sweet. My minimalist approach to added sugar definitely places this recipe in the relish category. The recipe has no added salt. I would describe this green tomato relish flavour as ‘tangy’. 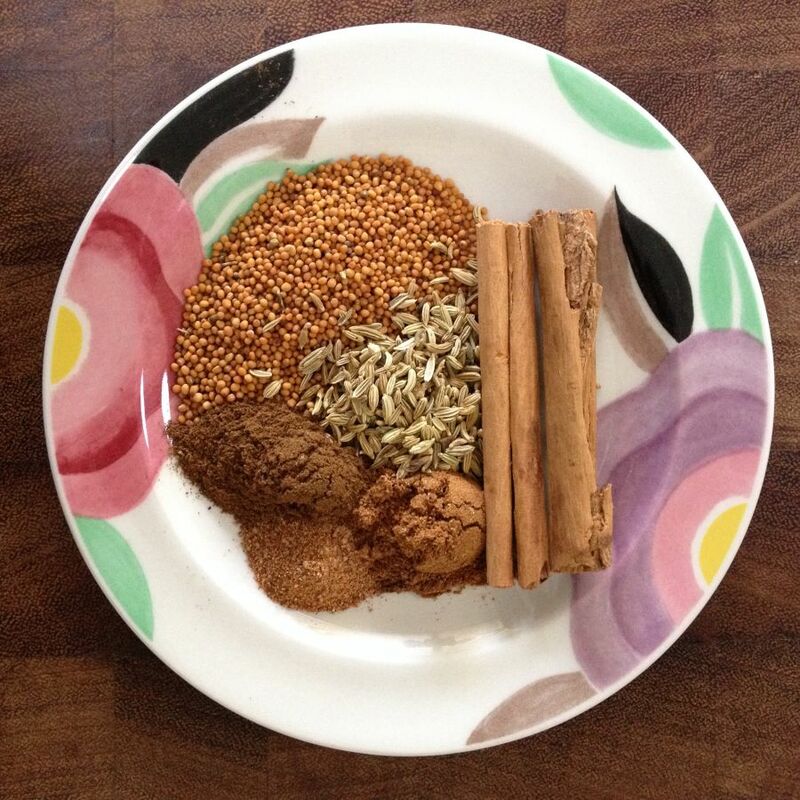 Add vinegar, sugar and spices to your pot, stir and bring to the boil. Bring to the relish to the boil on medium heat then reduce heat to simmer. Check and stir the relish every 15 minutes. About half way through your cooking time, wash your jars and lids in warm soapy water, rinse and dry off in an oven pre-set to 100oC. Keep them in the oven until your green tomato relish is cooked. If you are heat preserving your relish, then prepare your boiling water or preserver as outlined below. Once your relish is cooked ladle it into the sterilised jars, leaving a distance of 1cm from the rim. 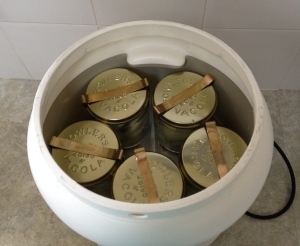 Seal the jars with the sterilised lids. 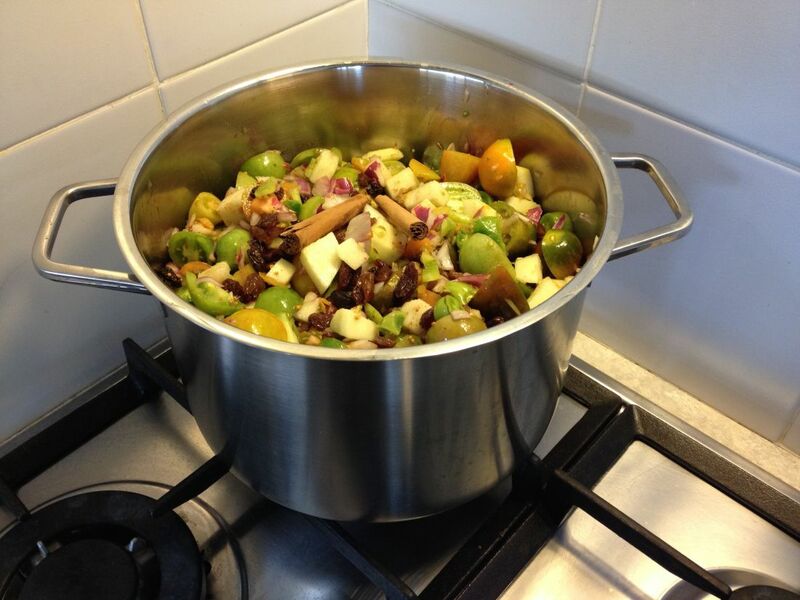 If you are heat preserving your relish, transfer your jars to the water bath or automatic preserver. For refrigeration storage, allow the jars to cool prior to placing them into the refrigerator. 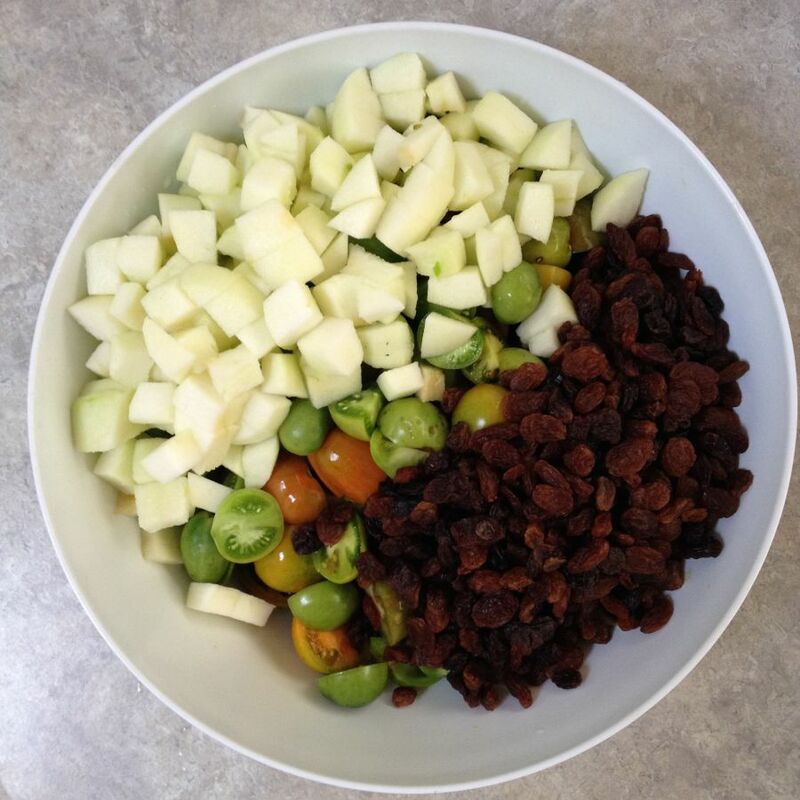 The green tomato relish will keep in the refrigerator for a few months, but if you have minimal space in your refrigerator, or you wish to keep the relish for longer than a few months then I would suggest heating the sealed jars for preservation. Longer term storage, around 12 months, in a dark cool cupboard or pantry requires heating the sealed jars. Place a folded cloth such as a tea towel or a steaming rack in the bottom of your pot. Add water to your pot. The level needs to eventually cover the lids of the jars, however the amount of water you need to add is affected by the number of jars you add (when you add your jars of pears the water level will rise). The level of water that I usually start with comes half way up the side of the jar. Remember you can add boiled water later if required. 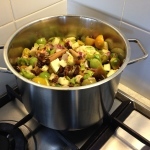 Gently boil the green tomato relish for 15 minutes. Allow the relish to cool for 24 hours before storing in a dry, dark, cool place. Check that all of the lids form an airtight seal. This is noticeable, as the raised centre of the lid will be sucked downwards as the contents cool, creating a vacuum seal. The lids make a very distinct popping noise as they seal. Prepare jars and relish as outlined above. 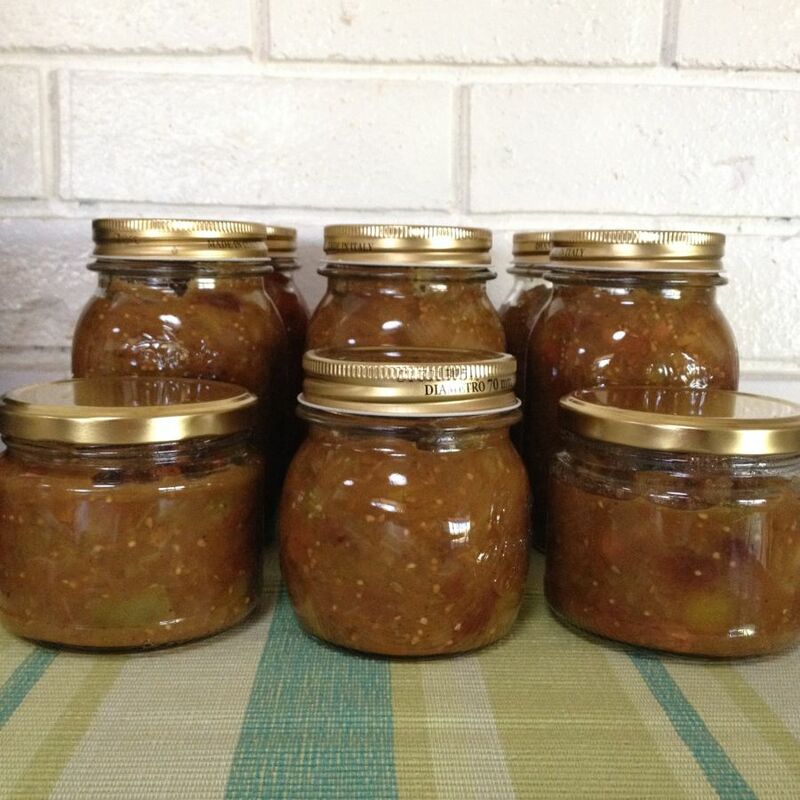 Place your packed jars of green tomato relish into the automatic preserver and cover the well-sealed jars with water. Follow the instructions provided with your preserver. Relish is another way to preserve the freshness and warmth of summer. Relish is a versatile accompaniment — to an egg omelette; a vegetable curry; BBQ, grilled or roast meat or it may be enjoyed in a sandwich.